Lahemaa National Park is just east of Tallinn. It is a place of breathtaking landscapes and unspoilt nature. You can find beautiful peninsulas and bays, forests and beaches, waterfalls and bogs seasoned with rich cultural history. This day trip is perfect for spending a day out of Tallinn and is designed to show you the beauty of the area in every season. PRICE INCLUDES: personal pick-up and return from your hotel, guide service, transport. PICK UP PLACE AND TIME: hotel, as agreed. It only takes an hour to drive from Tallinn to Lahemaa. The tour takes you to the oldest national park in Estonia, the most popular destination for day trippers staying in Tallinn. Lahemaa means “the land of bays” and as the name says it’s valued because of the natural beauty of its coastal landscape. The park itself covers a huge area of protected primeval forest, small rivers and a number of hiking trails. Whilst it definitely isn’t a zoo, it is famous for its rich wildlife. On our way to Lahemaa we also drop by Jägala waterfall. Our first stop is at Sagadi Manor, which helps us explain how German land-owners came to live in the Estonian countryside for centuries and give you some information about life outside of Tallinn, both in the past and the present. Today the manor contains a nice restaurant (an option for a lunch break) and forestry museum. Afterwards, a visit to the Beaver Trails gives you an opportunity to search for animal tracks, see the fauna and wildlife, understand the importance of forests in Estonian culture and traditions. Altja village is unique because it represents the architecture and style of our fishing villages, as they were before the border zone was established along Estonia’s coastline during soviet times. Taking a walk to the seaside you can get different emotion in every season, with: a nice sandy beach for swimming in summer, a powerful stormy sea in autumn, and a frozen sea to walk on in winter. Altja tavern is open for Estonian farm food lovers during the summer season. On our way back to Tallinn, we take a walk in Viru bog. A bog is a wetland landscape with a thick peat layer. There are limited types of vegetation adapted to this environment, bog pools and hollows. Besides the refreshing and safe walk you will also hear stories about Estonian beliefs and folklore related to the bogs. visit the forest and/or main house museum in Sagadi manor to get an even deeper understanding of the forests in Estonia and peek into the history-rich lives of manor landlords (fee not included in the trip price). spend more time in Lahemaa and let us book a cosy manor boutique hotel or nature farm accommodation for you and find more activities you might enjoy (e.g. longer hikes study-trails, rent a bicycle, visit an ecospa, or go on a birdwatching tour). From May to September we offer regular tours to Lahemaa in English. Regular tours start every day at 9.30 from Tallinn Tourist Info (Kullasepa 4/Niguliste 2). Price: 67 € per person, children (4-12 y) 37 € per person. Fishing net sheds in Altja village. Lahemaa National Park. Traditional Estonian houses in Altja Fishing village. Lahemaa National Prak Day Trip. In a bog. View on the bog from the observation tower. Admire Viru bog with a walk on a wooden trail. Lahemaa National Prak Day Trip. In Viru bog. Peaceful seaside in Lahemaa National Park. What a great trip this was!!!! We were staying in Tallinn for one week between 21st and 28th December and decided that we really wanted to get out of the city for at least one day to see something of the countryside. After looking around, we booked the trip to Lahemaa National Park with Prangli Travel, and am I glad we did. The day was wonderful from start to finish.Out excellent tour guide Mikk met us and one other very nice couple from Dubai, who were visiting from a stay in Helsinki, and we then went by minibus from the tourist office in Tallinn. Our first stop was Jagala Waterfall, and throughout the journey, Mikk told us much about our surroundings, nature in Estonia and interesting facts about the countryside and its people which would only be known by locals. Following this, we all went on to the Viru bog for a walk in the forest, which was lovely. Much of this walk was on wooden boards as the whole area was a lake many thousands of years ago, and the light fall of snow which we had as we began our walk, made it a perfect picture postcard scene, Throughout, Mikk passed on a lot of his knowledge of the area, and his natural enthusiasm for the beautiful Estonian forest, as well as giving us hints on survival techniques in what could be a very hostile environment, if the weather were to make an unfavourable turn! Lunch was taken at very nice country restaurant, quite new to Prangli Travel, called Lahemaa Kohvikann, situated in the willage of Palmse. Here, we enjoyed absolutely delicious homemade traditional Estonian dishes, washed down with very nice Estonian beer (in my case) and it was a good chance to get to know our fellow travellers better and also our excellent guide Mikk. Our next stop was the old fishing village of Altja, on the Gulf of Ftnland, which was reached through undulating foreat roads. In winter and with snow on the ground, the enviroment was quite desolate (although the village is in the process of being restored), but it was very invigorating and good to see. Again, the rocks in this area are very old, and I can imagine just how beautiful it would be in the summer with the sun shining. Our final port of call was Sagadi Mois, a beautiful pink washed manor house, at the centre of a large estate. Although closed due to the holiday period, it was very enjoyable to walk around the grounds and to hear Mikk’s interesting stories about the manor and its environs. Being out in the snow in such lovely surroundings reminded me so much of the film “Doctor Zhivago”. I cannot recommend this tour highly enough. Mikk was a very good guide, very friendly and with a good command of English and I thought it was very good value for money. Although Estonia is largely a very flat country, it is heavily forested with pines and silver birches and with the abundance of junipers and ice in the forest, you would have no trouble geeting drunk quite quickly if you were a fan of gin and tonic ! We will never forget the beautiful Jagala waterfall and we certainly hope to return. Thank you so much Mikk and Prangli Travel! We spent a wonderful day at Lahemaa National Park with Helen in January 2019. The landscape was just beautiful. Helen is very professional and very friendly. We really had a great day with her. We highly recommend this tour. The quality-price ratio is also excellent. It was awesome, we had a wonderful time! We would like to say thank you for arranging the Lahemaa Day Trip. Special thanks to our professional guide Mikk. We all enjoyed very much and understand Estonia more. We booked the day trip to the Lahemaa national park and were part of a small group of 7 people. The guide Kristiina was excellent, she tailored the trip according to our interests and didn’t rush the day. We visited the Jagala waterfall, followed a bog walk, explored Altja fishing village where we enjoyed a lunch of traditional Estonian food, and then went on to Sagadi manor. It was a relaxing way of visiting some of the more unspoilt parts of Estonia and was a great change from Tallinn city. We had a great day at Lahemaa National Park. Spent a lot of time on the beautiful coastline. All this with a very friendly guide who really knows everything about the history of Estonia. Kristiina, thank you for a wonderful day we had together on our walk to the park and bog. We really appreciated your knowledge and willingness to share that with us. We liked the warmth and humour you brought to the group making us all comfortable with each other. We also loved how you were able to help us enjoy the cultural aspects through your sharing of your own experiences including the culinary experiences. Your driving was outstanding as well. A day we will not forget. Christina was an excellent, charming and knowledgeable guide. We really enjoyed our day and recommend it. Christina was delightful. We got a real feel for modern Estonia. We had fun visit to Lahemaa national park, Jägala waterfall, Sagadi manor and Viru bog. Day had a lot of activities and sights to see. We observed beaver tracks, saw eagles, storks and swans and visited forestry museum. Our guide was friendly and knowledgeable about nature and animals. The tour was not rushed but we had time for everything. Bog area is very nice and we plan to visit Lahemaa again in the future. During our week’s stay in Tallinn, four of us took three tours with Prangli travel – all three were wonderful both for what we saw and for the three excellent and informative guides. Kristiina took us for a day trip to the Lahemaa National Park (frozen waterfall, frozen sea, manor house and excellent meal); Triin took us to a husky park owned by a delightful and welcoming couple, and for a ride with the huskies, Marko took us for a walk in the Kakerdaja bog and a two hour Estonian sauna. The arrangement of the tours was straightforward and communication with the company excellent. Thoroughly recommended. Very positive experience with a prepared and open tour guide Kristiina. Good Trip! Really friendly and adorable guide as well! Thanks Annika! Really nice trip in beautiful Lahemaa Estonia. We trully enjoyed the bog and the fisherman’s village. The waterfall is “properly saying” not part of the park but offers nice pics, though. Our private guide Annika was really lovely, adorable and instructive! Thanks again Annika! We very much recommend the tour to the Lahemaa National Park with Prangli Travel, especially with the tour guide Kristiina R. Due to her special knowledge we learned a lot about Estonia and it’s beautiful nature. We will visit Estonia again. Thank you very much, Kristiina, for this wonderful day! Thank You Annika and Peep for making us fall in love with Tallinn. We booked the Lahemaa tour and even had enough time to shop for souvenirs in Old Town within our cruise short layover. Highly recommended! I would like to say, that we were very happy we took a guided tour. Our guide was very knowledgeable, cheerful and always had some interesting fact or story on hand. Not to mention her enthusiasm and good mood. We really relaxed during this tour and enjoyed it very much. I can recommend this tour to everyone, since the distance walked is not so huge and you will see a lot of interesting places during one day. If we had chosen to visit Lahemaa on our own, it would be half the fun, so big thanks to Prangli travel and Kristiina for an awesome day. Coordinator was helpful, and it was really nice day full of joy and laughter. We will not visit these places without a tour coordinator help. Although the travel agency planned the whole tour, I suppose the experience is highly influenced by the tour guide. Our tour guide was a real expert! We are not English native speakers, she helped us gain knowledge of Estonia, and waited patiently when we discussed in mother tongue. We had a fantastic day-really enjoyed getting into the countryside and your guides were really friendly. Carmen had a tough task on her hands! We were due to go on a husky ride but with no snow anywhere in Estonia we opted for the Lahemaa National Park day trip. Early morning rain tried to dampem our spirits at the Jagala waterfall but by the time we have reached the Altja fishing village the rain was gone and we could enjoy the beautiful landscape. A special stop at the Kasmu Captians village museum and our search for the beavers made this day one to remember. A huge thank you to Carmen – she is passionate about her country and it shows. We would love to see more! 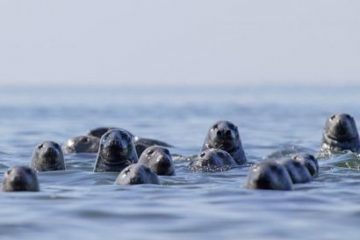 Join us and head out to the Malusi islands for a wildlife encounter to see seals in their natural habitat. 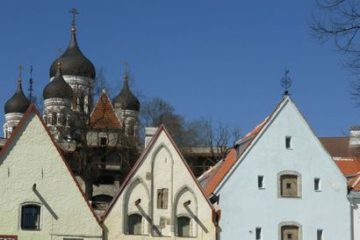 Visit this enchanting island, close to Tallinn, and enjoy its bio-diversity, unspoilt charm and unique heritage. Find out what makes Tallinn tick as we explore its medieval old town, baroque palaces and soviet-era buildings.